Hotel with the boutique-like look. Looks impressive. Rooms are spacial with a very comfortable bed. Guests have access to a kettle where they can prepare coffee or tea. Two bottles of mineral water. Breakfast, in my opinion, better than at Hilton in Warsaw. If you feel like a good, freshly-made scrambled eggs, just ask the personnel. Unique atmosphere with a very comfortable bed! Interesting architecture and decor. A hotel with unique atmosphere, very comfortable beds and a comfortable armchair in the room! Exquisite breakfasts, but you need to know, what is where. A comfortable bed, map of Szczecin with marked routes for pedestrians to explore the city. The routes are reflected in lines on pavements, so that you can explpre the city with great pleasure. Breakfast from the menu available to order as part of the offer - very good idea. The training course which I organized at the Dana hotel was prepared very well. The hall itself made an impression on the participants. Very good appetizers, availability of tea and coffee throughout the entire time was a plus. The projector was brilliant - compact and good quality. Truly great dedication. Price of the training course together with a small catering comparable to "ordinary" conference halls. A hotel in an elegant style. A beautiful, spacious room with a large and comfortable bed. Nice personnel. Good location of the hotel, very good and abundant breakfasts, nice and helpful personnel, for long time I didn't sleep in such a comfortable bed. Although the bed was on the side of the street, I couldn't hear the noise of trams passing by. A very good hotel in Szczecin. Delicious breakfast and very nice personnel. The hotel is very fresh, accessible for the guests and located nearby the City Centre (you can reach every place on foot. 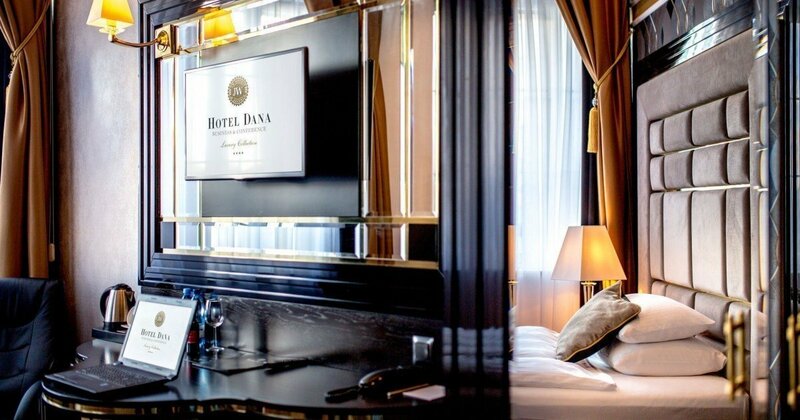 If somebody values professionalism and high standard in organization of conferences, Dana is the ideal hotel for such undertaking. The Most Beautiful Hotel In Szczecin and not only. Brilliant stylish interiors, very comfortable large beds and delicious food! When I asked, I very quickly received bacon, which was not on the breakfast table yet. I highly recommend this place. Thank you. Thank you for life-saving takeaway breakfast, delicious croissants and sandwiches! Brilliant rooms, very comfortable beds. Service on the highest level! I highly recommend this hotel, thank you! The hotel is brilliant! Elegant, big, but maintains intimacy. One could say: boutique-like. Deprived of this callousness and lack of individual approach to the customer. Service on the highest level. You can arrange everything, including services typical for concierge type personnel. The hotel is cleaned on a regular basis. Modern. At first glance it seems modest, but after crossing the threshold there are no objections. Everything is well-thought-out and arranged according to a clearly specified idea and vision. Abundance in every corner. A brilliant place for a training course for up to 50 people, a business meeting which requires concentration and discussion of important matters among high-ranking persons. Professional and exceptionally helpful personnel, impeccable decor, delicious food and affordable prices. I will associate Dana with all this :). A place worth a next visit. Not far from the very centre of Szczecin. What could we want more?